Red's Shoe Diaries: Local Fare; French Flair! 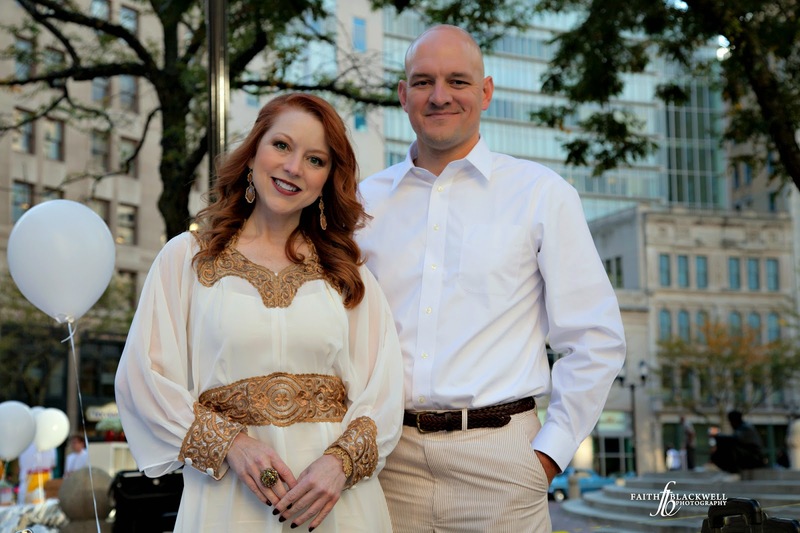 My thanks to 604 Studios for capturing a host of wonderful photos from the evening. The concept of "Diner en Blanc" is French, and originated with a man named François Pasquier, who invited a few friends to the Bois de Boulogne many years ago. To find each other in the park, they all wore white. The dinner was such a success that they decided to recreate it the next year. Each person invited other friends and the event grew organically into the 10,000+ dinner it is today. In Paris, this annual white party is always invitation only, and the location is kept top secret until the last minute. In fact, guests don't know where they're going until the buses arrive at the destination selected by the party's organizers, though it is always held at a very public (and often historic) locale, such as the Arc de Triomphe. If you're lucky enough to receive an invitation, you're expected to wear white, bring dinner in a picnic basket, and champagne to share with friends both old and new. 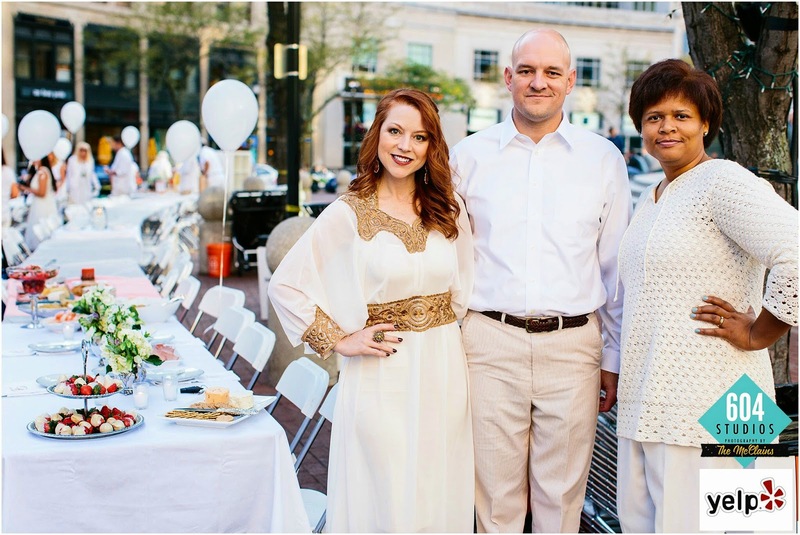 Yelp executed Indianapolis' own version of Diner en Blanc with aplomb, staying fairly true to the original concept while at the same time allowing for a more diverse and not so secret guest list. 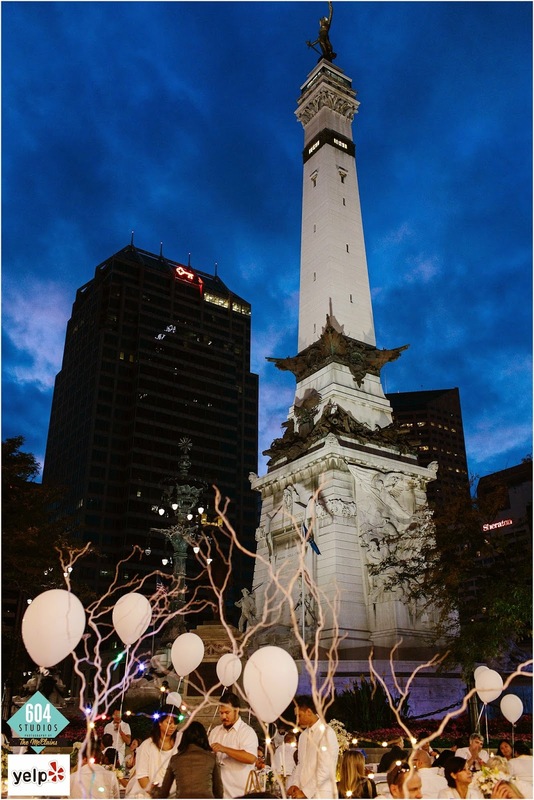 The choice of location on historic Monument Circle and in front of Hilbert Circle Theater (home of the Indianapolis Symphony Orchestra), while not a secret, was inspired. The Monument itself provided a spectacular visual backdrop and a quintet from the ISO provided a spectacular soundtrack for the festivities. 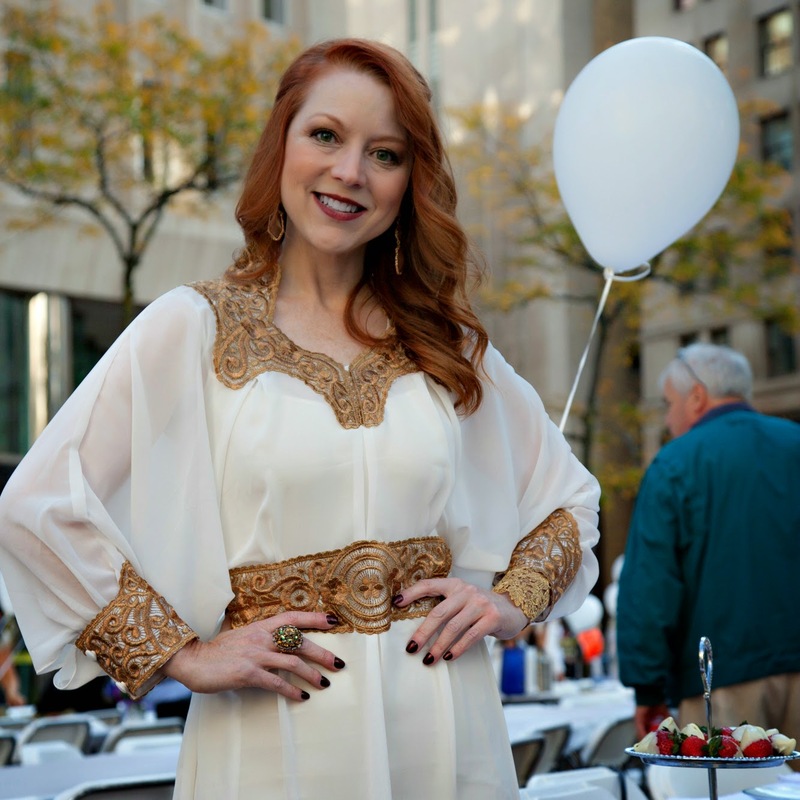 In keeping with Yelp's mission to help people discover local businesses, guests were also encouraged to bring locally sourced goods, and several generous local sponsors were on hand to provide beverages and other treats for the party's 1000 Hoosier guests. My dinner companions and I heartily embraced the local focus. We brought shrimp cocktail with St. Elmo's world-famous cocktail sauce and "Watermelon Fire and Ice Salsa" that I made fresh that morning using the last of the Farmer's Market watermelons and locally grown fresh cilantro. My friend Faith brought B. Happy peanut butter from Zionsville, which we enjoyed on fresh Honeycrisp apple slices. This rich concoction was a mix of fresh peanut butter, milk chocolate, rice crisps, and toffee bits. It is quite possibly the most decadent peanut butter concoction I've ever tasted, and I may or may not have eaten the rest of the jar with a spoon within just a few days of the party! My dress for the evening was a caftan (not of the Mrs. Roper on Three's Company variety!) that I purchased at a street fair in India a few years ago without a clue where I might ever wear it. It was an impulse purchase but I fell in love with the delicate gold crochet details on the collar, waist, and cuffs and remember thinking, "this would be perfect if I ever got invited to a white party...." Et voila! My earrings were a local find, however, from Grace Boutique in the Fashion Mall, which always has unique accessories. I wanted to try something new with my hair for the night, and Amanda at Studio 2000 on Monument Circle styled my hair with a waterfall braid that I was sad to brush out the next morning. It was fun to try a different style and support local business at the same time. 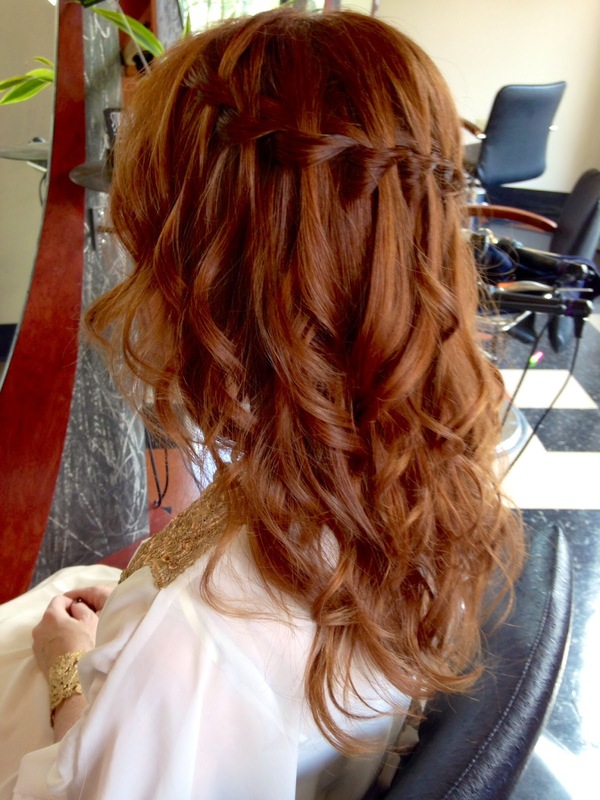 Amanda at Studio 2000 convinced me to try this waterfall braid - I loved it! As you can see from the montage below, just as I decided to pull out my grandmother's china and use silver teapots to hold fresh flowers for the picnic, other revelers likewise embraced the opportunity to create elaborate and elegant tablescapes to hold lavish feasts of local fare. 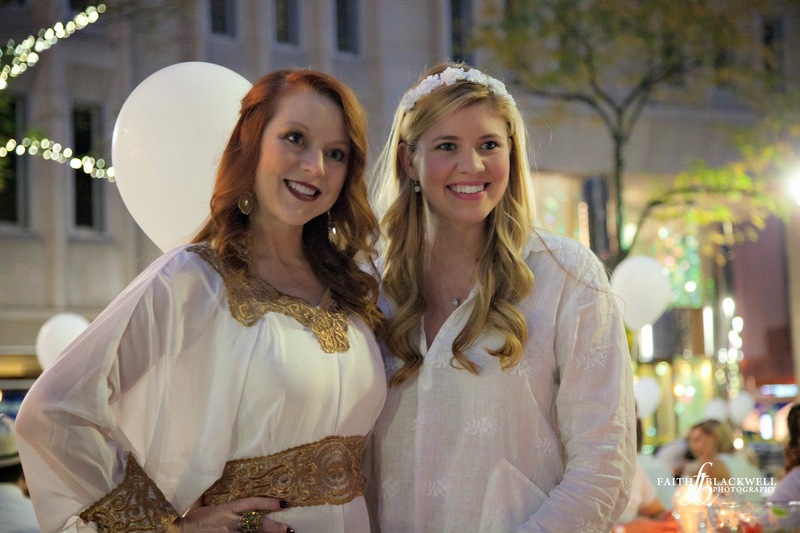 Revelers embraced the theme, and were eager to share their creativity and delicious delights with friends and strangers alike. Hoosier hospitality at its finest. As the symphony quintet played on into the night, it seemed the party was over all too soon, but the memories of a fantastic and unique evening will long linger. 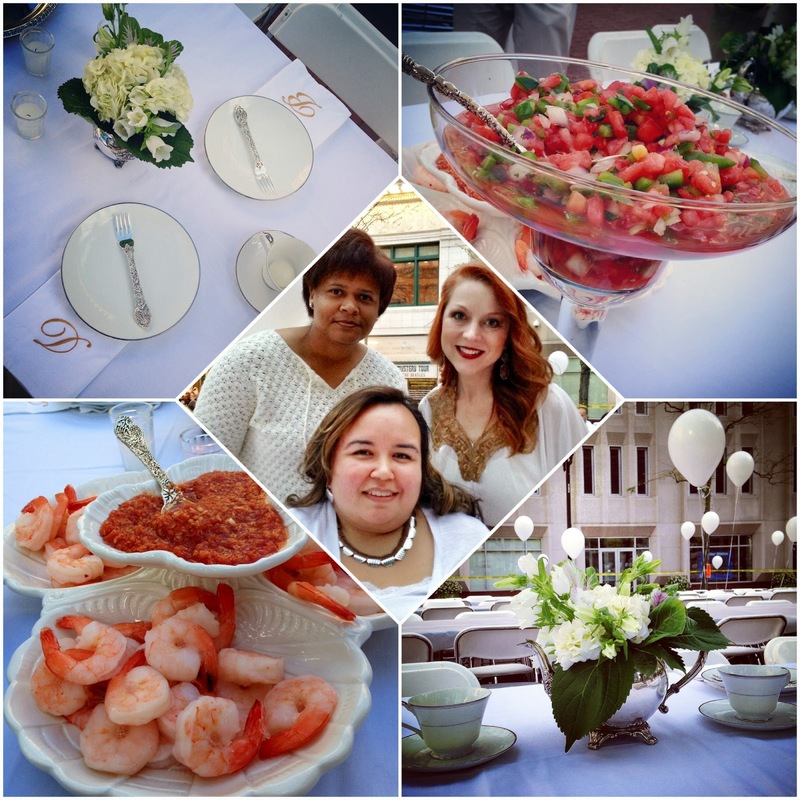 It was an occasion to catch up with old friends and make lots of new ones in a setting that defined casual elegance. 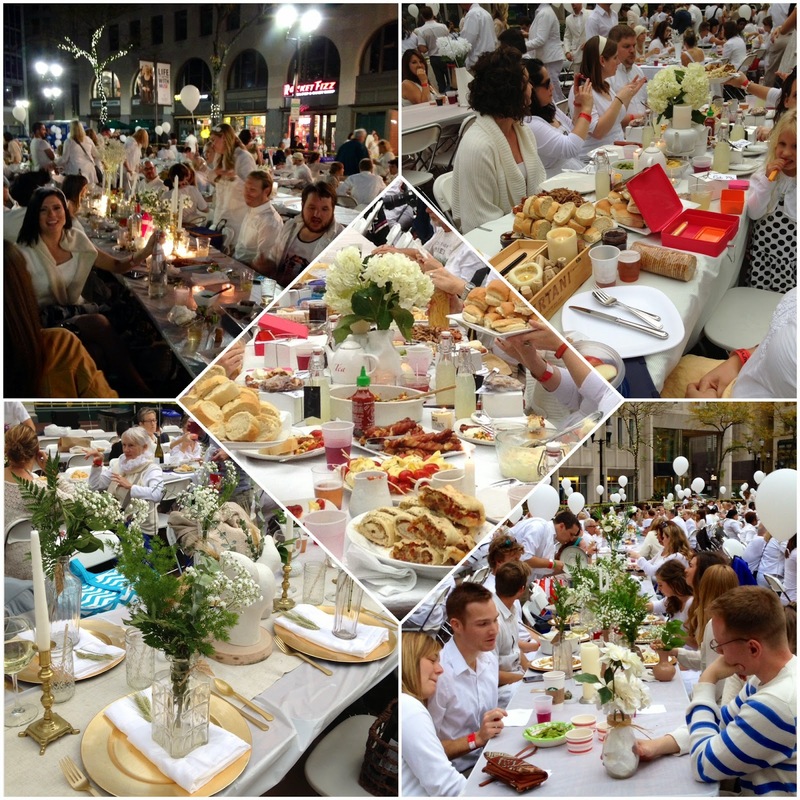 I hope, like the French original, that Yelp will make Diner en Blanc an annual affair! 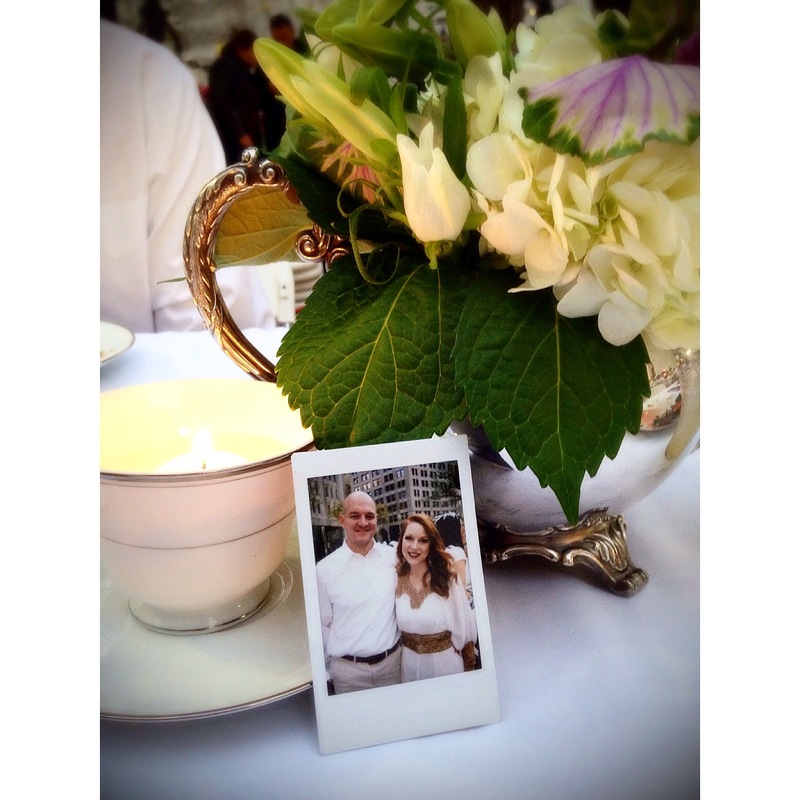 Madison treated friends to "instant" mementos from the evening using a Hello Kitty Polaroid camera; I used my grandmother's teacups to hold floating votive candles and an antique silver teapot as a centerpiece to hold flowers from Fresh Market.